For his strong performance during Sueño MLS 2011 tryouts in Chicago, Major League and Allstate have announced that 14-year-old Ian Chacón of Cicero, Ill. has earned the Allstate “Good Hands” top goalkeeper award – “El Portero Allstate” – in conjunction with local MLS club Chicago Fire. Chacón was presented with the award and an El Portero Allstate goalkeeper jersey at Calumet Park in Chicago on Sunday April 17th. The talented Unity Junior High School student impressed the Chicago Fire scouts with his vocal leadership in goal and his composure during one-on-one breakaway situations with older forwards. As El Portero Allstate of the Chicago Fire event, Chacón will be among three regional Sueño MLS award winners eligible to be selected to compete at the Sueño MLS presented by Allstate national finals in Dallas on May 5-8. Allstate’s “Good Hands” goalkeeper award is a new component to the Sueño MLS program, now in its sixth year providing youth soccer players across the country the chance to realize their dreams of playing for an MLS club. 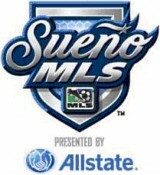 For more information and competition updates on Sueño MLS, soccer fans can visit SueñoMLS.com.